This is a comman site on the Mumbai roads. 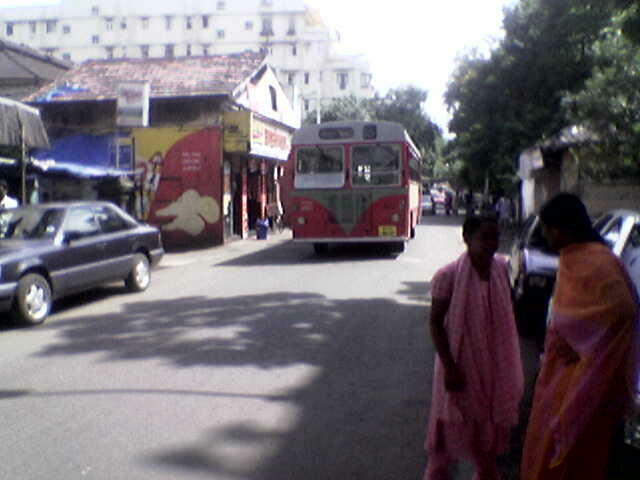 Bombay Electrical State Transport is what the full form of BEST is. 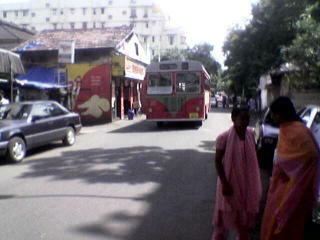 The buses were introduced by the British and they are still running on the roads of Mumbai. The buses have 2 people in uniform which is brown coloured. They also have some kind of badge with some numbers written on them. These 2 people are the driver and the conductor. Both of them Marathis. The Conductor yells in the bus " Tiket Tiket Pudhe Bola. " You must have change on you most of them are very tempramental they will tell you " Sute Dya." His job is to sell you the ticket and then do TING TING at every stop, that is an indication to the driver to move on. Now about the Driver. He is ok only if in a bad mood he will drive like hell forget the potholes and packed roads. There is 1 Horn which goes Bhopoo Bhopoo ( at least thats what i think it sounds like) which he will blow every now and then to make people move out of the way. These buses are of some types. 1 is the normal ones they can be distinguished by the white writting on the black background.They are slow buses stop at many more stops. The other is the Limited buses these are red writtings on white background they have LTD written in very small thats in english in marathi it will be Maryadit.These buses have lesser stops and move fast. They are a little expensive than the normal ones. The 3rd type is the fast buses. They are also written in red with white background. Only thing different is that there is Jalad written there again in small. Jalad meaning fast. The rate of the tickets is again a little more than the normal buses and the Limited ones. There is one more feature of the Buses is the Frequency. That means what is the gap between two of the same number's buses. This could be of either 5 mintues 10 mintues or bay be half hour. BEST wishes to all those who travel by these buses. that loaded with sweetness... one was meant specially for this one. allow these hitches for a first time user! Yellow Mishoo. I don't understand his comment too..